Calgon Carbon designs and manufactures advanced wastewater ultraviolet light (UV) disinfection systems for wastewater treatment to prevent the spread of waterborne pathogens to lakes, streams, rivers, and coastal water. 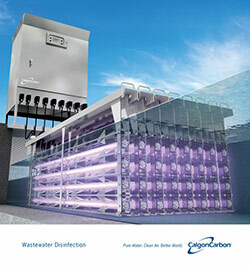 Calgon Carbon’s product line for Wastewater Treatment is the C3 Series of open channel UV disinfection products. It can be used to replace or reduce the traditional use of chlorine as a disinfectant. Chlorine has been shown to have significant environmental impact via toxicity to aquatic life, residual disinfection by-products (DBPs) and presents safety risks to plant operators that handle and store the chemical. The C3 Series can be used to replace or reduce the traditional use of chlorine as a disinfectant. Rigorously bioassay-tested across a broad range of effluent quality, the C3 Series has been tested and recognized for the requirements of the California Water Recycling Criteria (Title 22). This standard is recognized worldwide as the most-stringent standard for water reuse.